Patriot, a leading manufacturer of high performance computer memory, SSDs, gaming peripherals, consumer flash storage solutions and mobile accessories, today announced the release of the Viper DDR4 SODIMM. Designed to support gaming laptops and small form factor systems, such as the Intel® NUC, to make gaming more accessible while on the go and free up desk space, the Viper SODIMM will provide a solid system upgrade. The Viper DDR4 SODIMMs will be available individually in capacities of 8GB and 16GB and in dual kits of 16GB (2x8GB) and 32GB (2x16GB). With speeds ranging from 2400MHz to 2800MHz, the Viper SODIMMs will provide users with faster load times and improved response rates. The new Viper DDR4 SODIMMs also feature a high performance heat shield for superior heat dissipation to ensure solid performance during the most grueling gaming session with a low profile that offers flexibility to fit easily into virtually any system. Compatible with XMP 2.0, the Viper SODIMM’s plug and play technology makes it the ideal RAM choice for consumers looking to upgrade their laptop, notebook or Mini-ITX system. Backed by Patriot’s award winning customer service, the Viper SODIMMs come with a lifetime warranty and are hand tested for quality assurance and system compatibility. 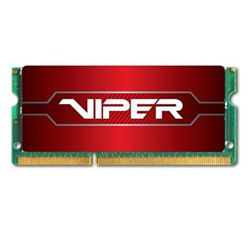 The Viper SODIMMs will be available for purchase, worldwide, online and in stores starting June 10, 2016 for a starting MSRP of $34.99 USD for the 2400HMz 8GB single DIMM to $169.99 USD for the 2800MHz 32GB dual kit. For more details on the Viper SODIMM and other Patriot products visit: https://patriotmemory.com.